Through the modern miracle of electricity, you can visit RICK GRUNDER - BOOKS from the comfort of your computer, and spend money! I still receive payment the old-fashioned way, but offer thoroughly modern browsing: Here you will find not only rare books, but intriguing papers (handwritten letters and short printed items including original newspapers), early photographs & illustrations. Check out the unusual stuff waiting for you on my electric shelves . . .
BOOKS: ". . . friends illustrious in speech, intelligence, government, war . . . content with a corner in my humble house, never reluctant or boring, eagerly obedient to my command, ready to come or go at my call." MANUSCRIPTS: Letters and records written by hand, more rare than any printed book. Precious stewardships, the roots of history. Seriously examined and guaranteed, with provenance. NEWSPAPERS: Fresh to the world when it happened; still filled with surprises for us today. PHOTOGRAPHS AND EPHEMERA: Original pictures and cards, mementos, posters. The closest things we have to a time machine. ILLUSTRATIONS: Original views and engravings from the times themselves. See through our ancestors' eyes. 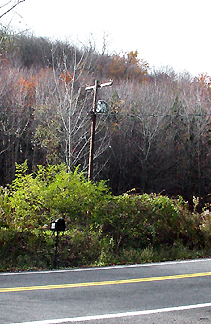 Picture at the top of this page: Electricity comes even to the woods of Upstate New York (no cable, gas, water or sewer, but a little telephone line runs right through my woods). That pole stands in the water of Mary's pond after spring runoff; you should hear the frogs and other mysterious things there, late on a summer night!